With this week's introduction of an Intel-based Mac mini, Apple has begun moving their third product line (after iMac and PowerBook) to Intel CPUs. Now we just need to wait for the iBook, Power Mac, Xserve, and 12" & 17" PowerBook replacements. On the OS front, OS X 10.4.5 has already been cracked for generic Intel hardware, and by using VMware in conjunction with Linux, it's now possible to run Windows XP on an Intel-based Mac. CUPERTINO, California - February 28, 2006 - Apple today unveiled the new Mac mini with the Intel Core Duo processor, delivering performance up to four times faster than its predecessor and providing even greater expansion in the same innovative and incredibly compact design. * Starting at just $599, the Mac mini is the most affordable way to enjoy iLife '06, the next generation of Apple's award-winning suite of digital lifestyle applications, and features the Apple Remote and Front Row so you can play your music, enjoy your photo slideshows, watch your DVDs, iMovies, music videos and television shows from across the room. "With the new Mac mini, Apple has now moved 50% of its entire product line to Intel within 60 days - a record transition," said Philip Schiller, Apple's senior vice president of Worldwide Product Marketing. "The new Mac mini is now up to four times faster with the Intel Core Duo, includes even greater expansion in the same incredibly compact design, and is the most affordable way to enjoy Front Row and iLife '06." The new Mac mini offers a completely new system architecture for performance up to four times as fast as the previous Mac mini, including a 667 MHz frontside bus and 667 MHz DDR2 SDRAM memory expandable to 2 GB. With the latest high-performance connectivity options, every new Mac mini now includes built-in 10/100/1000 Base-T Gigabit Ethernet for high-speed networking, built-in AirPort Extreme 802.11g WiFi for fast 54 Mbps wireless networking**, built-in Bluetooth 2.0+EDR (Enhanced Data Rate) and a total of four USB 2.0 ports, twice as many as the previous generation. Mac mini includes a DVI interface and a VGA-out adapter to easily connect to a variety of displays, including many of today's most popular flat panel televisions, and now features both analog and digital audio outputs to easily connect to a home stereo. The new Mac mini includes iLife '06, the next generation of Apple's award-winning suite of digital lifestyle applications featuring major new versions of iPhoto, iMovie HD, iDVD, GarageBand and introducing iWeb, a new iLife application that makes it super-easy to create amazing websites with photos, blogs and Podcasts and publish them on .mac for viewing by anyone on the Internet with just a single click. All the iLife '06 applications are Universal applications that run natively on the new Intel-based Mac mini for maximum performance. The new Mac mini is shipping today and will be available through the Apple Store (www.apple.com), Apple's retail stores and Apple Authorized Resellers. Build-to-order options and accessories include up to 2 GB DDR2 SDRAM, 80 GB, 100 GB and 120 GB Serial ATA hard drives, iWork '06 (preinstalled), AirPort Express and AirPort Extreme Base Station, Apple Wireless Keyboard, Apple Wireless Mouse, Apple USB Modem and the AppleCare Protection Plan. The new Mac mini line is also available to education customers in the US and Canada through the Apple Store for Education at www.apple.com/education/store or by calling an Apple education sales representative at 800-800-APPL. * Based on estimated results of industry-standard SPECint and SPECfp rate tests. SPEC is a registered trademark of Standard Performance Evaluation Corporation (SPEC); see http://www.apple.com/macmini for more information. ** Actual speed will vary based on range from the base station, environmental conditions and other factors. Did the Mac mini Get Better or Worse? "Then I got to the specs on the graphics card. Hold on, there is none, well not one you want anyway. It has a Intel integrated graphics processor. A GMA 950 graphics processor to be exact, with 64 MB of DDR2 SDRAM shared with main memory. Ya shared. According to Apple's website, Memory available to Mac OS X may vary depending on graphics needs. Minimum graphics memory usage is 80 MB, resulting in 432 MB of system memory available. "Meaning when you buy this Mac, you better max it out with memory (not from Apple unless you want to pay $300) because working with iMovie or iDVD will bring up that beach ball we all hate if you don't." Link: Did the Mac mini Get Better or Worse? "Meet the new Mac mini, same as the old Mac mini - we could go on and on about its new ports, faster processor, etc., but we all know it's an Intel Mac mini, that's it and that's all. Click on to see some more shots." "The entry level 1.5 GHz Mac mini with 667 MHz bus, 512 MB RAM, 60 GB hard drive and Combo CD/DVD, features Intel's Core Solo CPU rather than the Core Duo CPU found in the new iMac and MacBook Pro. 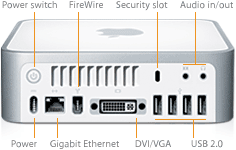 A dual core Mac mini is also available, however, and will feature the Core Duo chip. This 1.67 GHz version features a 80 GB hard disk and 8x SuperDrive. "The new Mac mini appears to have the same form-factor. According to Apple the 1.5 GHz version is 2.5x faster on integer calculations and 3.2x faster in floating point calculations than its predecessor. The 1.67 version is said to be 4.8x faster in integer calculations and 5.5x times faster in floating point calculations than it's predecessor." "We now have Windows XP running on the Intel-based Macintosh - as a guest operating system under the Linux version of VMware. This is quite exciting and promising, especially since the performance of Windows XP seems quite amazing (based on our limited test run so far) - mind you, the kernel and the environment we are using experimental and unoptimized, so it would not be unreasonable to expect even better performance. "To anybody who has used Windows XP under Virtual PC on the PowerPC version of Mac OS X: you will simply be blown away by how fast Windows XP runs under VMware on the new hardware." "Questions about the TPM security of Apple's OS X continue, now that the infamous Maxxuss has struck again. Patches for 10.4.5 are now spreading across the web only nine days after the official 10.4.5 release. It seems that Apple included no significant security changes in this update, which was released on the same day that Maxxuss introduced his hacks for 10.4.4."